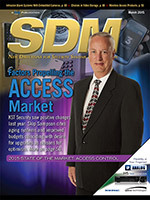 KST Security President Skip Sampson dawns the cover of SDM magazine’s March 2015 addition. In the “2015 State of the Market: Access Control” article, he highlights the positive market trend the security industry is currently experiencing. Toward the end of 2014, integrators across the country started seeing an increase in budgets and, in turn, approvals for large projects, providing a positive trend in spending across corporate America. With these increased budgets comes increased responsibility. What are we spending our money on? What do we consider a priority that is essential to business functionality? The answer? Security. Unfortunately, many people believe in a reactive approach to security. “We’ve never had an incident, so we probably won’t have any, right?” Wrong. 2009 crime data reports over 4.6 billion dollars in stolen goods and over 9 million property crimes. Now you’re thinking, “OK, I’m convinced but what is an integrator and why are they any different than my current security provider?” In short, security integration involves bringing multiple security systems together to work as one security solution. For instance, let’s look at an access control system – readers, doors, locks. Those are standard, but you also probably have a keypad by that same door. So, not only do you have to provide a valid card but also have an access code and be able to disarm the security system within so many seconds of opening that door. Now, let’s merge the two. What if a valid card presented to the reader automatically disarms the system? Better yet, if the door goes into alarm, the closest camera starts recording the event and sends a 10 second video capture of the actions to your mobile device to alert you of the issue. THAT is true security integration at its finest. Getting the most out of your equipment and systems working together to provide the best over-all security solution for your business. As a systems integrator, KST Security works with many different manufacturers to find the latest, most reliable products, to meet your needs.